To [[Trinitarianism|trinitarian]] Christians (which for many centuries has represented the vast Christian majority), God the Father is not at all a separate god from the Son (of whom [[Jesus]] is the incarnation) and the [[Holy Spirit]], the other members of the [[Godhead (Christianity)|Christian Godhead]]. Trinitarian Christians describe these three persons as a [[Trinity]]. This means that they always exist as three distinct "persons" (Greek ''hypostases''), but they are one God, each having full identity as God himself (a single "substance"), a single "divine nature" and power, and a single "divine will". Other Christians, however, have held a very diverse variety of alternative ideas. A handful have described the Father, Jesus Christ and Spirit as each a distinct, eternally existent being ([[tritheism]]), or as a different "manifestation" of a single being ([[modalism]]). Some have theorized that the relationship of Father and Son began at some point probably outside of normal "history" ([[Arianism]]); and others have believed that God became a Father when he uttered his creating &Lambda;&omicron;&gamma;&omicron;&sigmaf; ("logos" or "word"), who is both a principle of order and a living being to whom God bears the relationship as Father (some [[gnosticism|gnostics]]). Others found strong affinity with traditional [[paganism|pagan]] ideas of a savior or hero who is begotten by deity, an idea of the Father similar to [[Mithraism]] or the cult of the Roman emperor. For most Christians, the person of God the Father is the ultimate, and on occasion the exclusive addressee of prayer, often in the ''name of'' Jesus Christ. The [[Lord's Prayer]], for example, begins, "Our Father who art in Heaven...."
In the New Testament, God the Father has a special role in his relationship with the person of the Son, where Jesus is believed to be his Son and his heir (Hebrews 1:2-5). According to the Nicene Creed, the Son (Jesus Christ) is "eternally begotten of the Father", indicating that their ''divine'' Father-Son relationship is not tied to an event within time or human history. ''See'' [[Christology]]. Creator, Redeemer, and Sanctifier: by Doug McManaman A Brief Look at Fatherhood, Trinity, and Analogy in a clear, simple and gentle article. A glimpse of Truth. The Divine and the human natures are united hypostatically in Christ, that is, joined to each other in one Person (De fide.) (a) Christ Incarnate is a single, that is, a sole Person. He is God and man at the same time. (b) The God-Logos is connected with the flesh by an inner, physical or substantial unification. Christ is not the bearer of God, but is God really. (c) The human and the divine activities predicated of Christ in Holy Writ and in the Fathers may not be divided between two persons or hypostases, the Man-Christ and the God-Logos, but must be attributed to the one Christ, the Logos become Flesh. It is the Divine Logos, who suffered in the flesh, was crucified, died, and rose again. (d) The Holy Virgin is the Mother of God since she truly bore the God-Logos become Flesh. Christian Perfection... the 10,000% Promise! 21.Q. Is there but one God? 22.Q. Why can there be but one God? 23.Q. How many persons are there in God? 24.Q. Is the Father God? 25.Q. Is the Son God? 26.Q. Is the Holy Ghost God? 2. Q. What do you mean by the Blessed Trinity? 28.Q. Are the three Divine Persons equal in all things? 29.Q. Are the three Divine Persons one and the same God? 30.Q. Can we fully understand how the three Divine Persons are one and the same God? 31.Q. What is a mystery? A. A mystery is a truth which we cannot fully understand. "Unity" means to be one, and "Trinity," three in one. 21. Q. Is there but one God? A. Yes; there is but one God. 22. Q. Why can there be but one God? 23. Q. How many persons are there in God? all things-the Father, the Son, and the Holy Ghost. or brought into existence by the other. 24. Q. Is the Father God? A. The Father is God and the first Person of the Blessed Trinity. 25. Q. Is the Son God? A. The Son is God and the second Person of the Blessed Trinity. 26. Q. Is the Holy Ghost God? A. The Holy Ghost is God and the third Person of the Blessed Trinity. A. By the Blessed Trinity I mean one God in three Divine Persons. A. The three Divine Persons are equal in all things. same divine nature and substance. works of God, and there is but one God. Persons are one and the same God? same God, because this is a mystery. together is the part we do not understand-the mystery. * 31. Q. What is a mystery? Church. It is a truth which we must believe though we cannot understand it. him it is several miles in depth. presence of God, shall see clearly many things that are unintelligible now. flower and one a blue. Where did the red and where did the blue come from? From the black seed, or the brown soil, or the pure water, air and sunlight? though we do not understand it. believe very little and make ourselves ridiculous. Jesus, my God, I adore You, here present in the Blessed Sacrament of the altar, where You wait day and night to be our comfort while we await Your unveiled presence in heaven. Jesus, my God, I adore You in all places where the Blessed Sacrament is reserved and where sins are committed against this Sacrament of Love. 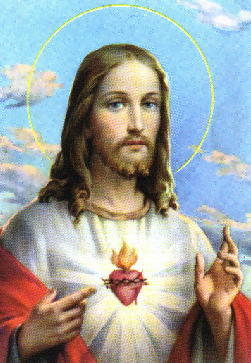 Jesus, my God, I adore You for all time, past, present and future, for every soul that ever was, is or shall be created. Jesus, my God, who for us has endured hunger and cold, labor and fatigue, I adore You. Jesus, my God, who for my sake has deigned to subject Yourself to the humiliation of temptation, to the perfidy and defection of friends, to the scorn of Your enemies, I adore You. Jesus, my God, who for us has endured the buffeting of Your passion, the scourging, the crowning with thorns, the heavy weight of the cross, I adore You. Jesus, my God, who, for my salvation and that of all mankind, was cruelly nailed to the cross and hung there for three long hours in bitter agony, I adore You. 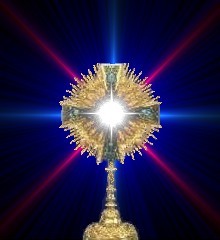 Jesus, My God, who for love of us did institute this Blessed Sacrament and offer Yourself daily for the sins of men, I adore You. Jesus, my God, who in Holy Communion became the food of my soul, I adore You. Jesus, for You I live. Jesus, for You I die. Jesus, I am Yours in life and death. Amen. The Holy Spirit is "God"
The idea that One God could be three Persons is not easy for a child, who lacks abstract reasoning abilities, to understand. Realizing this fact, religious instructors often dismiss young students' questions by saying "The Trinity is a mystery". Unfortunately, this gives the children the impression that one can know nothing about the inner nature of the Triune Godhead, and that the doctrine of the Trinity can neither be explained nor understood at all. This is not so. A "mystery" is not something we can know nothing about; it is something which we know but can never entirely comprehend. Thus everything having to do with our Infinite Creator is a mystery, for the depths of God are ultimately incomprehensible. Yet we do know something about God, for God has revealed Himself to us. And one thing God has revealed is that there are Three Persons in the Godhead. This is not a contradiction. If Mother Church said "God is Three Persons - but really only one Person," or "There are three Gods - but really only One God," those would be contradictory statements. But she says that there are Three Persons in one God, meaning that the Three Persons share one and the same Divine Nature. The words person and nature describe two different things. Person denotes who someone is, while nature denotes what one is. So if we ask "Who is God? ", the answer is "God is Three Persons: Father, Son and Holy Spirit". If we ask "What is God?" the answer is "God is One - a Single Divine Nature". If we put these two truths together we find that God is Three Divine Persons who share one Divine Nature. Here's an example to help you understand: Let's say there are three men - John, James and Joe. Each one thinks, loves and decides for himself, yet they are joined in such a way that they all share the same soul. John can think with James' intellect, because it is also his own; James can love with Joe's will, because it is his will as well. Now, if we ask John; "Are you a person?" he'd say "Yes, I am a person." James and Joe would say the same thing, for each is a distinct person from the other. Yet we can't say there are three distinct human beings, since they share one human nature among them. Likewise with God. There are not three Gods, there is only one God; one Divine Nature possessed equally and totally by three distinct Persons. Some have tried to claim that Christians copied the Trinity from similar pagan concepts. This is not the case, however. The accompanying article, Is the Trinity a Pagan Concept? addresses this charge in-depth. So where does this doctrine really come from? The Bible! Though the word trinity never appears in Scripture, the concept is based on the biblical teachings regarding God. Sacred Scripture tells us that there is only one God (Dt 4:35; Isaiah 45:5; 46:9). Yet it also refers to three distinct persons as "God": God the Father (Gal 1:1), Jesus Christ His Son (Jn 1:1; 20:28) and the Holy Spirit (Acts 5:3,4). Since God cannot lie or contradict Himself, His Word cannot contain discrepancies. This seeming contradiction is easily reconciled by the belief that the Father, Jesus and the Holy Spirit are Three distinct Persons in One God. This is the truth which God was conveying through Scripture, a truth which Christians later labled "The Trinity" (literally "tri-unity"). Now if God is Love, and love needs these three elements, then these elements must exist in God. And they do: God the Father is the Eternal Lover, God the Son is the Beloved (Eph 1:6; Mt 3:17) and the Holy Spirit is the Divine Love binding Them together eternally. Some may object "What if one loves oneself? Then there are only two elements". Actually, there are three elements here as well, for the "beloved" in this case is actually ones self-concept! We each have a particular concept of ourselves (which may or may not be accurate!). If we "love ourselves" we are really loving our self-concept, and if we don't "love ourselves" it's really that self-concept which we find unlovable for some reason. So in love of self, the "lover" is the self, the beloved is the self-concept, and the self-love is the third principle. This is also an excellent image of the Holy Trinity, for it clearly reveals the origin of the Beloved Son. The Second Person of the Trinity is the Personal Expression of the Father's eternal Self-Concept. Thus the Beloved Son is also called the "Word" (John 1:1), the Expression or Utterance of God. The Father loves the Son because the latter is a perfect Image of Himself (Col 1:16; He 1:3), a perfect Self-Concept (after all, how could the Omniscient One have an imperfect Self-Concept?). And the Holy Spirit arises from the Father's love for His Son/Word. Thus the Father, Son and Holy Spirit do parallel the Self/Concept/Love-of-Self "trinity" mentioned above. (The main difference being that the Former are three distinct Persons, while the latter are not). The Persons of the Trinity are not exactly like human persons. The Father, Son and Holy Spirit are not three separate "consciousnesses" in God, each with His own intellect and will. Rather they are three distinct subjects of consciousness who share one Intellect and one Will. The distinction between the Three Persons is in their relation toward one another: the Father is the "Begettor", the Son is the "Begotten One", and the Holy Spirit is the "Spiration". This is how the Three are differentiated from one another. Though each Person is distinct from the other two, they do not act separately. What the Father does, the Son and Holy Spirit do as well. The Godhead acts as one. We sometimes appropriate an activity to one Person or another, such as when we call the Father "Creator", the Son "Redeemer" and the Spirit "Sanctifier". Yet these designations are not absolute; the entire Trinity actually participates in creation, so all Three Persons are "Creator". The entire Trinity makes us holy, so all Three are "Sanctifier" as well, etc.. So God is Three Persons; So What? Some people seem to believe that the doctrine of the Trinity is irrelevant to our spirituality and Christian walk. Nothing could be more untrue! Christians are called to have a relationship with God; surely it is important for us to know the One Whom we worship and love. The truth that God is "Three-in-One" also shows us that there is a "Community of Love" within the Godhead. God is not a solitary Monarch, reigning all alone in Eternity. Rather, God is a "Family", so to speak; a Father and a Son bound together by an Eternal Love which is a Third Person, the Holy Spirit. This is a very beautiful thought. Finally, the doctrine of the Trinity allows us to understand how God gives us a share in His own Divine Life. The Father sends the Son, Who becomes flesh, taking on Himself our human nature. The Son then unites us to His Sacred Humanity, making us one Body with Him. By this union we also partake of His divine nature (see II Peter 1:4), and so become sons and daughters of God in the Eternal Son. Jesus then loves the Father in us, and the Father loves Jesus in us, and so their mutual Love, the Holy Spirit, becomes present in our souls. The Spirit causes us to proclaim that Jesus is Lord (I Corinthians 12:3) and cries within us "Abba Father" (Galatians 4:6). Yes, it is the Holy Trinity who divinizes us, making us created partakers in God's own life and adopted members of the Heavenly Family. By the act of Creation and Redemption, the Godhead has "extended" (so to speak), the Eternal Family into the created realm; not by making us God by nature, but by the Son becoming human and giving us a share in the divine nature. Most Holy Trinity: A Union of Love.